That was the intro to a talk Joe Gebbia, one of Airbnb’s co-founders, recently gave at TED. You can watch it here to find out how the story ends, but (spoiler alert) the theme centers on trust — one of the most important challenges we face at Airbnb. Designing for trust is a well understood topic across the hospitality industry, but our efforts to democratize hospitality mean we have to rely on trust in an even more dramatic way. Not long ago our friends and families thought we were crazy for believing that someone would let a complete stranger stay in their home. That feeling stemmed from the fact that most of us were raised to fear strangers. “Stranger danger” is a natural human defense mechanism; overcoming it requires a leap of faith for both guests and hosts. But that’s a leap we can actively support by understanding what trust is, how it works, and how to build products that support it. 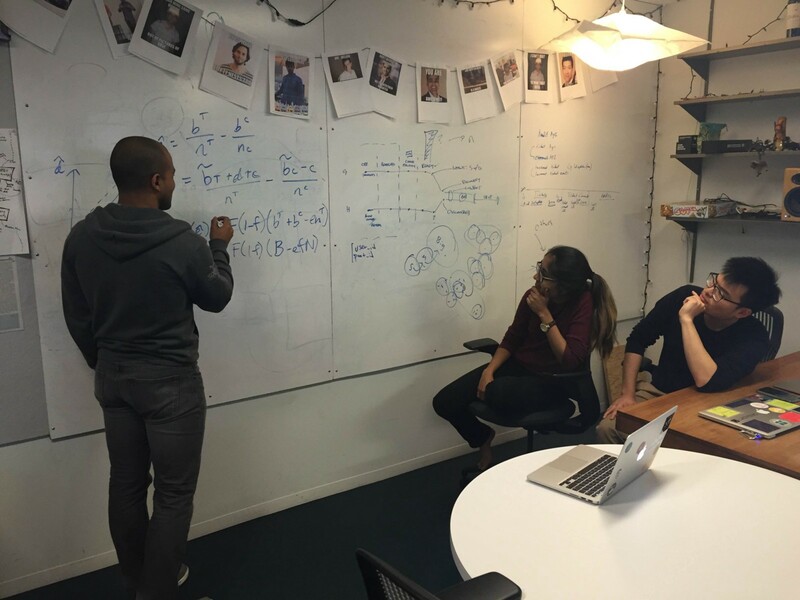 How best to support trust — particularly between groups of people who may not have the opportunity to interact with each other on a daily basis — is a core research topic for our data science and experience research teams. In preparation for Joe’s talk, we reflected on how we think about trust, and we pulled together insights from a variety of past projects. The goal of this post is to share some of the thoughts and insights that didn’t make it into the TED talk and to inspire more thinking about how to cultivate the fuel that helps the sharing economy run: trust. When Airbnb was just getting started, we were keenly aware of the need to build products that encourage trust. Convincing someone to try us for the first time would require some confidence that our platform helps to protect them, so we chose to take on a series of complex problems. We began with the assumption that people are fundamentally good and, with the right tools in place, we could help overcome the stranger-danger bias. To do so, we needed to remove anonymity, giving guests and hosts an identity in our community. We built profile pages where they could upload pictures of themselves, write a description about who they are, link social media accounts, and highlight feedback from past trips. Over time we’ve emphasized these identity pages more and more. Profile pictures, for example, are now mandatory — because they are heavily relied upon. In nearly 50% of trips, guests visit a host’s profile at least once, and 68% of the visits occur in the planning phase that comes before booking. When people are new to Airbnb these profiles are especially useful: compared to experienced guests, first time guests are 20% more likely to visit a host’s profile before booking. In addition to fostering identity, we knew we also needed defensive mechanisms that would help build confidence. So we chose to handle payments, a complicated technical challenge, but one that would enable us to better understand who was making a booking. This also put us in a position to design rules to help remove some uncertainty around payments. For example, we wait 24 hours until after a guest checks-in before releasing funds to the host to give both parties some time to notify us if something isn’t right. And when something goes wrong there needs to be a way to reach us, so we built a customer support organization that now covers every timezone and many languages, 24/7. One way we measure the effect of these efforts is through retention — the likelihood that a guest or host uses Airbnb more than once. This isn’t a direct measure of trust, but the more people come to trust Airbnb, the more likely they may be to continue using our service, so there’s likely a correlation between the two. Evaluating customer support through this lens makes a clear case for its value: if a guest has a negative experience, for example a host canceling their reservation right before their trip, their retention rate drops 26%; intervention by customer support almost entirely negates this loss — retention rebounds up from 26% to less than 6%. We didn’t get everything right at first, and we still don’t, but we have improved. One thing we learned after a bad early experience is that we needed to do more to give hosts confidence that we’d be there for them if anything goes wrong, so we rolled out our $1 million guarantee for eligible hosts. But each year, more and more people are giving this a try because we’ve been able to build confidence that their experience is likely to be a good one. This isn’t the same as trusting the person they will stay with, but it’s an important first step: if trust is the building that hosts and guests construct together, then confidence is the scaffold. Just like the scaffold on a building, our efforts to build confidence make it easier for the work of trust-building to happen, but they won’t create trust. Only hosts and guests can do that. Researchers define trust in many ways, but one interesting definition comes from political scientist Russell Hardin. He argues that trust is really about “encapsulated interest”: if I trust you, I believe that you’re going to look after me and my interests, that you’re going to take my interests to heart and make decisions about them like I would. People who are open to trusting others aren’t suckers — they usually need evidence that the odds are stacked in their favor when they choose to trust a stranger. Reviews thus form the raw material that we can collect and then surface to users on our platform. This is one of our most important data products; we refer to it as our reputation system. The reputation system is an invaluable tool for the Airbnb community, and it’s heavily used — more than 75% of trips are voluntarily reviewed. This is particularly interesting because reviews don’t benefit the individuals who leave them; they benefit future guests and hosts, validating members of the Airbnb community and helping compatible guests and hosts find each other. Having any reputation at all is a strong determinant of a host’s ability to get a booking — a host without reviews is about four times less likely to get a booking than a host that has at least one. Given the importance of reputation, we’re always looking for ways to increase the quantity and quality of reviews. Several years ago, one member of our team observed that reviews can be biased upward due to fears of retaliation and bad experiences were less likely to be reviewed at all. So we experimented with a ‘double blind’ process where guest and host reviews would be revealed only after both had been submitted or after a 14-day waiting period, whichever came first. The result was a 7% increase in review rates and a 2% increase in negative reviews. These may not sound like big numbers, but the results are compounding over time — it was a simple tweak that has improved the travel experiences of millions of people since. Once trust takes root, powerful community effects begin to emerge and long-standing barriers can begin to fall. First and foremost, people from different cultures become more connected. On New Year’s Eve last year, for example, over a million guests, hailing from almost every country on earth, spent the night with hosts in over 150 countries. Rather than staying with other tourists, they stayed with locals, creating an opportunity for cross-cultural connection that can break down barriers and increase understanding. 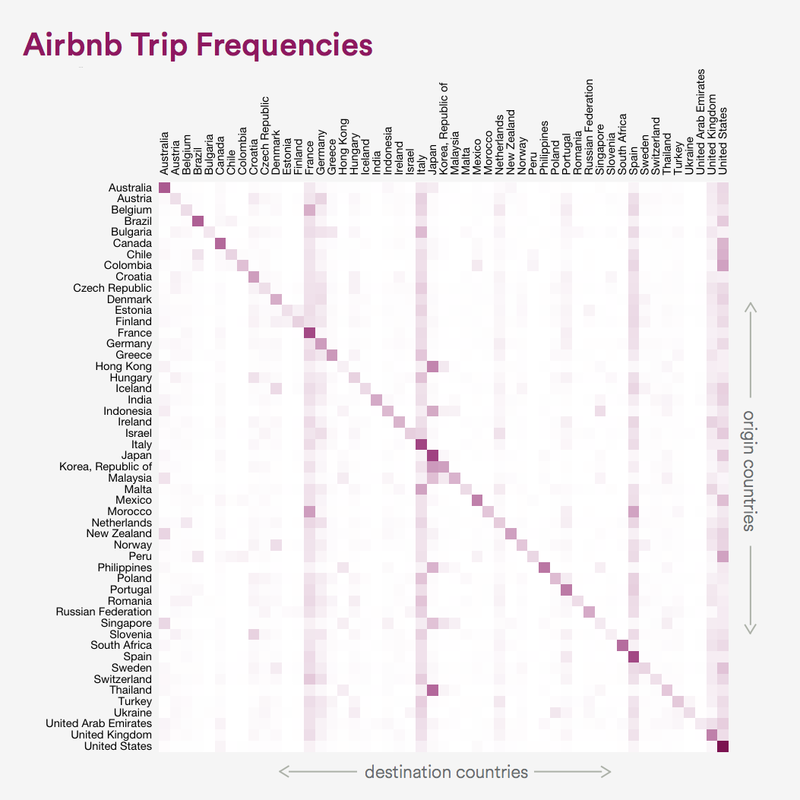 This is visualized in the graphic below, which shows how countries are being connected via Airbnb trips. Countries on the vertical axis are where people are traveling from, and countries on the horizontal axis are where people are traveling to. The associated link will take you to an interactive visualization where you can see trends in connections relative to different measures of distance. Airbnb experiences are overwhelmingly positive, which creates a natural incentive to continue hosting. Hosts’ acceptance rates rise as they gain more experience hosting. And we see evidence of their relishing the cross-cultural opportunities Airbnb provides: guests from a different country than the host gain a 6% edge in acceptance rates. Hosting also produces more practical benefits. About half of our hosts report that the financial boost they receive through Airbnb helps them stay in their homes and pay for regular household expenses like rent and groceries; depending on the market, 5–20% of hosts report that this added source of earnings has helped them avoid foreclosure or eviction. The remaining earnings pads long-term savings and emergency funds, which helps them weather financial shocks in the future, or is used for vacations, which provides similar economic benefits to other markets. As communities become more trusting, they also become more durable; they can serve as a source of strength when times are tough. In 2012, after Hurricane Sandy hit the east coast, one of our hosts in New York asked for help changing her listing’s price to $0 in order to provide shelter to neighbors in need. Our engineers worked around the clock to build this and other features that would enable our community to respond to natural disasters which resulted in over 1,400 additional hosts making spaces available to those affected by the hurricane. Since then, we have evolved these tools into an international disaster response program, allowing our community to support those impacted by disasters — as well as the relief workers supporting the response — in cities around the world. In the last year we have responded to disasters and crises including the Nepal earthquake, the Syrian refugee crisis, the Paris attacks and most recently Tropical Storm Winston in Figi. Joe, Brian, and Nate realized from the beginning how crucial trust was going to be for Airbnb. These are just some of the stories that have followed years of effort to build confidence in our platform and facilitate one-on-one trust. While the results are quite positive, we still have a long way to go. One ongoing challenge for us is to concretely measure trust. We regularly ask hosts and guests about their travel experiences, their relationships with each other, and their perceptions of the Airbnb community overall. But none of those are perfect proxies for trust, and they don’t scale well. The standard mechanisms researchers often use to measure trust are cumbersome, and we can’t reliably infer trust from behavioral data. But we’re working to build this measurement capacity so we can continue to carefully design and optimize for trust over time. Our motivation to understand trust doesn’t end with the need to build great products — it’s also about understanding what communities full of trust can do. In one night last year, 1.2m guests stayed with 300,000 hosts. Each of those encounters is an opportunity to break down barriers and form new relationships that further strengthen communities over time.